Cabot WaterWorks offers a wide variety of convenient payment options for our customers. Simply choose the option that best suits your needs. If paying Online just click the green "Pay Your Bill Now" button and follow the prompts. You will need to set up an account with Payclix the first time that you use it. You will need to have your Cabot WaterWorks account number, your bill balance and an email address when you register. You will then be prompted to create your own password for your account. Payclix accepts MasterCard, Visa, Discover Card as well as e-Check payments. Payclix is a third party payment system and they charge 2.99% of your bill balance plus a .69¢ service fee for all credit/debit payments. E-Check payments are only charged the .69¢ service fee. You also have the option to set up automatic payments (JITAPS - Just In Time Automatic Payment System) with your credit card, debit card or checking account. All payments made with Payclix are administered solely by Payclix. The worry-free way to pay your water bill. With this service, your monthly bill is automatically deducted from your checking or savings account and credited to your Cabot WaterWorks account(s). There is no set-up fee or charge associated with this method of payment. 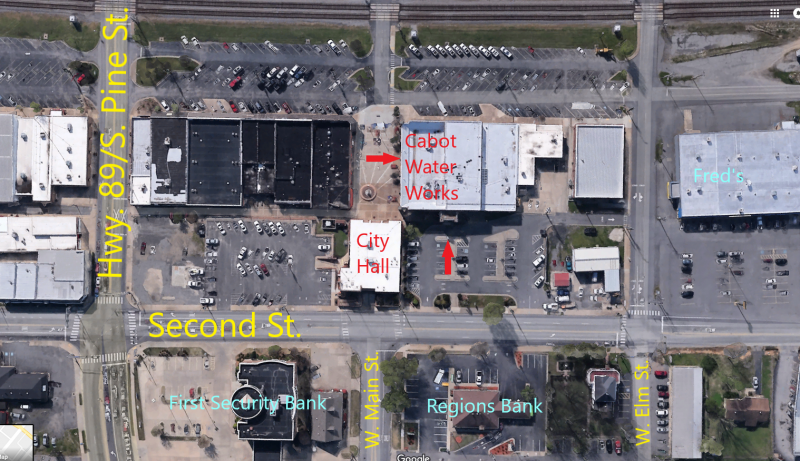 All bank drafts with Cabot WaterWorks are administered solely by Cabot WaterWorks. To set up for Automatic Bank Draft or to make changes to your existing Cabot WaterWorks bank draft, simply fill out the PDF Draft Authorization Form located in the "Water Service Forms" under the "Customer Service" drop down menu and e-mail it to customerservice@cabotwaterworks.com along with a copy of your check. You may also print and complete the Draft Authorization Form and attach your voided check. It can then be mailed, placed in one of our drop boxes or brought into a customer service representative located at the main office. If paying by check or money order by mail, please include your payment stub along with your payments. To avoid late fees, please mail your payment at least five-seven business days before the due date specified on your bill. Payments in office may be made with cash, check or money order. Payments may also be made using credit cards and debit cards through Payclix. Red arrows on map below indicate drop box locations.